Did it seem to you that this week’s episode went by quickly? Well it ended nine whole minutes before the hour! We were so annoyed. It was a good week though. 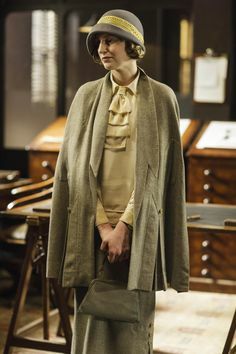 I was totally enthralled by the clothes in this episode! Edith’s outfit in town, that cloche hat and cape with the yellow tie? I LOVED it. Mary’s lingerie? Her evening clothes? Even Cora’s clothes delighted me this week. 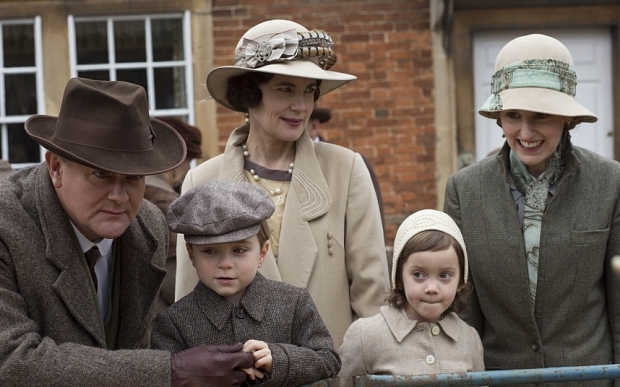 Look at little Marigold’s hat and coat. So sweet. On to my stream of consciousness thoughts on the episode. I really kind of felt for Mrs. Drew for a while, but taking off with Marigold vaulted her into the crazy category for me. Do you think that maybe Mr. Mason will be able to take over his tenancy? Would that solve things? I do think that Mary will find out about Marigold soon and I hope she’s kind about it. I would like to see those two get along better. I hate the acrimony there. I am glad they have an answer to the reason for Anna’s miscarriages. I really love how Mary jumped in to help and is so concerned about Anna and Bate’s happiness. I wish she were as concerned about Edith. So this feud between Isobel and the Dowager is pretty funny. I just can’t help but root for the Countess, Isobel is so preachy and sanctimonious. I hate that. I really feel sorry for the doctor as well I want him to stay in his beloved cottage hospital and be happy. Weren’t those pigs cute? 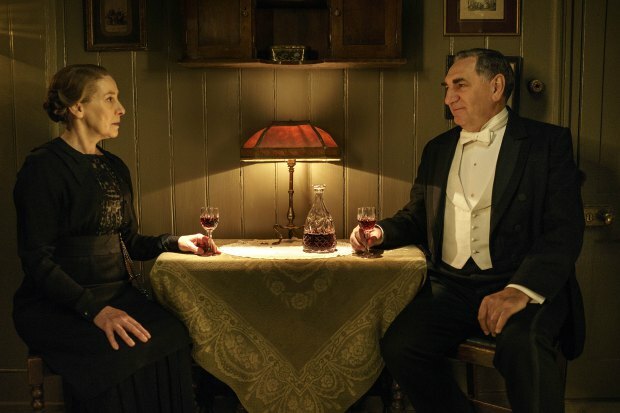 It’s nice that Mary is doing a great job as estate manager for Downton. I am a big fan of how Mary has evolved in this series. I am starting to feel badly for Thomas and it’s annoying me. That man who interviewed him treated him very badly and he is living in such flux right now. I hate to see anyone suffer which means he’s becoming more sympathetic somehow,which I don’t care before because I’ve enjoyed disliking him :). The wedding! I hope Mrs. Hughes prevails and has her simple village wedding. Mr. Carson is being particularly obtuse in this matter and it does not bode well. Could Mrs. Hughes possibly be about to put Lady Mary in her place? I can’t wait to see how this resolves itself. Only six more days til next time! I KNOW Mr. Mason will get that tenancy because when Cora was talking with Daisy she had an idea, right after talking about what was going on with the Drews. I’m really proud of Edith and hope she gets a backbone to the new guy running the magazine, or at the least fires him. I too, feel bad for Thomas. He knows no one likes him there, but can’t go anywhere else. It’s got to be hard. It was easy to not like him when he was so manipulative, but now he’s pitiful. I hope Mrs. Hughes and Mr. Carson get a touch of what they both want. A simple ceremony followed by a reception at the estate would be nice.